I cannot do wheel pose. That is a fact. For a long time it frustrated me. I became disappointed with yoga. I grew tired of trying and what could have been something good for my body and my spirit, became a difficulty, a hindrance, a limitation. That was so until I let it go. Then everything changed. I still am not able to do wheel pose. It turns out the structure of my shoulders does not allow for it. But it does allow for so many other poses. My yoga practice became something else, something wonderful, when I released my insistence on what should be, my resistance to what is. Everything changed, even if nothing didn't. 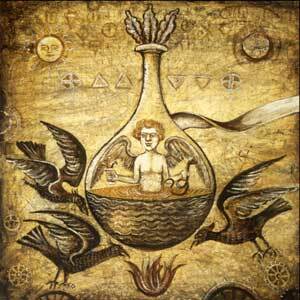 That is alchemy. It begins with willingness. It begins with releasing resistance. 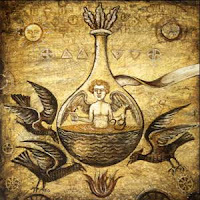 Alchemy, psychological and mystic, abides in an absence of resistance, allowing knowledge, guidance, inspiration and synchronicity in. It changes everything, even if nothing changes. Yet, everything does. We change. Our perception changes and expands allowing for deeper wisdom and understanding. Resistance is a wall we hit ourselves against. We feel awful when we do. Yet our tendency is to keep hitting the wall. Nothing changes while we do. We don't change. We don't grow. We become stuck behind that wall. Nothing flows. Our energy, our frames of mind, our creativity, and our productivity become stagnant. There's a physical, psychic and emotional blockage. When we resist, we don't progress, we don't learn, we don't grow, we don't enjoy. Resistance creates anxiety and anxiety creates inflammation in our bodies and in our emotional systems. Willingness, though, releases the anxiety. It allows us to flow. We move. We regenerate and enliven. We change. Everything changes. Today is a good day to alchemize an issue we have been resisting. Let us be willing for it to be, whatever it is. In doing so, we allow it to change. Let us release our resistance to the state of the economy, the course of the industry we work in, that our children have minds and beliefs of their own, that there are certain things we cannot do, a loved one's homosexuality, the death of someone we love, the changes we have to make to be healthier, to forgive someone who has hurt us, to apologize for something we have done, to make amends, the next step to meet a goal, learning something new, forging al alliance, doing something awkward, to make a commitment, letting go of a bad habit, starting a new exercise program, meditation, change. From resistance, to willingness, to alchemy – our perceptions change, our thoughts change, our circumstance change, we change, everything changes.